What is Discord? If you are an online gamer, and you have not heard about Discord till now, you should start thinking about it. Discord is an application available for Windows, Android, Linux & Mac for the sake of online voice chat. Some people do refer Discord as the Skype for gamers. This application has been developed to help players to communicate and coordinate with the help of private servers and even let the player’s text and voice chat with other people. It combines the feature of a chat lobby, a message board, and another VoIP chatting system into some other app, which may or may not contain the facility of voice chat. With the multiplied popularity of online multiplayer games, especially the battle royal games and MOBA games the popularity for third-party voice chatting software which uses private server increased very high. Games like FortNite, PUBG, DOTA 2 taken the need and usefulness of this app to another level. Players of the same team can chat within them without using the in-game voice chat facility. As sometimes due to the disturbance caused by the internal voice chat system the game lags and crashes, and in any competitive gaming it cannot be taken lightly. Though the game is not the only need for using this app. One can simply use this app for encrypted private server voice chat or calls over the internet. This app is completely free and the best in utility and user friendlessness in its kind. If you are looking for an app which can enable your laptop to call anyone, or you are tired of adjusting with the problem s of inbuilt voice chat system of gaming then this app is just for you. First, you have to search for Discord over the net, you can simply find the website of Discord with a simple Google search. There you have to create an account of yours, you can use your existing Facebook or Google plus ID to log into Discord. Then using the same account, you can download and login it for any of your devices like Windows, Android or Linux. Know more: How to install Discord on Ubuntu. Once you are set up, you can start either a new Discord server for yourself and you can send out invitation codes right away to your friends. To create a server, you just need to enter a valid server name, no extra tools or support needed to be installed. The user can not browse for available existing servers for joining, hence no one can join your server unless you send them the invitation code. Though it is very easy to join any active community, it is very popular among the live game streamers also, so you can join any of your favorite live streamer on discord if he offers an open Discord channel. Other than these there are also some open invitations of verified server available which anyone can join. Official PUBG server is one of the most popular in this type. Many other Streamers and content creators also offer the same. If you want just to communicate with a small group of friends like only with your squad mates while playing online games, both Skype and Discord will get the job done almost in the same manner. But while the no of people increases the latency in performance also increases, especially in the case of Skype. While, Discord stands out giving the user an option to run the app through a browser, which gives the user the flexibility to change individual people’s mic levels and in result a performance with lower-latency voice chat, which helps very much when talking a large number of people across the globe. Discord app also has an overlay system using which it can be accessed while playing a game. Without using the alt+tab function you can tweak audio levels or can type a text message with the help of this overlay system, which gives the user a really distinctive advantage. 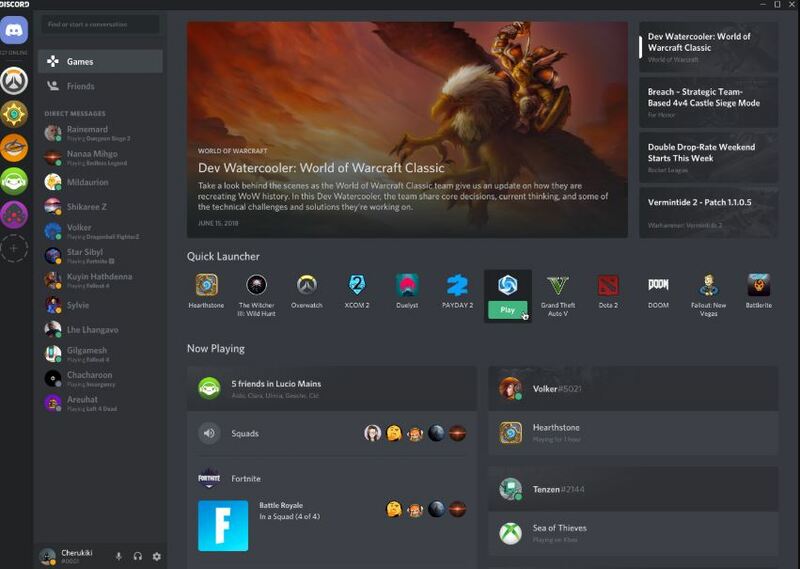 Discord is available over the internet for download for Windows and Mac computers and can be accessed by simply downloading it from the official website and running the app or one can also use the browser-based UI mode which also can be accessed from the official website of Discord. The browser version has some limitations, of course, because of the obvious reason, limitations like unable to detect webcam, unable to process multiple audio devices etc. The browser version also does not support the screen-share function which lets the user stream their desktop views. Discord is now available also for Android and iOS devices and includes most of the options and function available on the desktop version. Though the screen sharing is absent in the mobile version also, the video call function is enabled there. There is a Linux edition of the same is also available now, though al the Linux distribution is not supported, you can read the Linux support info at the official page of Discord for more details. In mobile Discord can also act as a tool, which can be used to make free calls worldwide. Managing a large group of people is the area where Discord excels the most. In a custom-made Discord server, separate channels can be differentiated on the basis of the level of access permissions for different users. This custom management mode for a large group proved to be one of the most useful tools for Discord. This prevents the problem of putting everyone in a single message thread on a voice channel. There are several AI moderators and automated moderation tools available which help the channels from going out of bound even if the channel has no active moderator. Very big servers may have the capacity of 100 thousand users. Especially the PUBG community and the Minecraft has some crazy figure in a number of players. If being well organized a Large Discord server may look like as simple as an organized message board. The announcement and guideline threads will show up in the top and there will be several more-specific locations for people to gather down below. Then also in the background, it is running in real time and most of the channels have voice chat activated at the same time. Is it only for the large group community? Yes, even if you are a bunch of friends with the strength of 5-10 or a group of college mates of 30 people, then also Discord is the right choice for you. Discord is also a very good tool for keeping tabs on who’s available to play as it adds any installed game in your PC and notify you if any friend of yours is playing any of the same game. Discord can also notify others of what game you’re playing now, so users don’t have to use many other different programs to see who’s online who is available to play. Even if your friends are on different games then also you can pop open a separate Voice channel to chat with them or a text channel to chat with them. A Twitch or YouTube streamer may have an audience of any size, Discord is a great app to manage the followings. Discord gives the viewers more flexibility than a simple chat window on Twitch or YouTube can do. A streamer can also be more secure for Discord’s Streamer Mode, which intelligently hides the invite codes, Discord Tags and any other personal information during a stream. Streamers can also sync their account of Discord to their YouTube or Twitch accounts and do things like setting up subscriber-only channels and also can give subs special permissions on the server automatically. In general, a streamer’s Discord server is a good one-stop shop for interaction among the creator and the followers, whether the creator is live or not. Yes, it is called Discord Nitro. There are many types of plans, starting from $5 up to $50. With the Paid package you get a bigger image upload cap (8mb to 50mb) and enhanced quality screen sharing option, though it will consume more bandwidth too. The rest of the gain through the paid package is mostly cosmetic changes. Most of the tools and functions are free of cost and the team of Discord has promised the users that they will not lock the free features behind a paid Nitro package in future. If you are curious about the cosmetic gains, there are animated avatars, animated emojis in chat which can be unlocked in Nitro package. The Discord Tag number with the name also can be changed and a special badge of will be there on display. There are many functions in Discord which are not available with the standard product, to use those you have to download some third-party apps to patch with Discord directory, these are known as a bot. SO, simply yes there are many Bots or third-party app available for Discord. Discord also has a list of endorsed bots available on the official page. Integration apps for Twitch or YouTube are also available for download. There are also some unofficial bots available to do more with the Discord app. Some of the bots available are for free but many of them are not free also. Unofficial Bots do not provide a guarantee that they will stay updated regularly the main Discord app or not, so if you are buying something beware. On conclusion Discord is easy to use, full of utility and fun to use, that is why it is suitable for gamers and enthusiast users.